The ART Cleanbox - why you might need one, and how to modify it for subwoofer usage. Why might I need one? When connecting consumer level gear to pro-level amps, there is often not sufficient signal level to drive the pro gear to full output. An ART Cleanbox with up to 20dB gain, inserted between the source and the power amp will boost the signal level to what is required. When using a BFD (Behringer Feedback Destroyer) filter unit, it is handy to use the LED level meter to monitor the signal level. In an ideal setup, the yellow warning LED should just flicker as the maximum output of the subwoofer is reached. When driving the BFD from a consumer-level source, the more sensitive input is often needed for the LEDs to display their full range. When the LEDs indicate full signal, the actual output level is still at the consumer level. Placing a Cleanbox before the BFD, and setting the BFD to the less sensitive input level, as shown in the following diagram, lifts the operation to pro level, whilst retaining the use of the LED bargraph to monitor maximum output. Block diagram underneath. Sturdy metal case comes with stick-on feet. 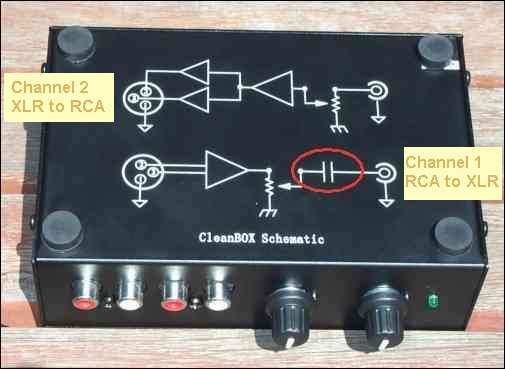 The most common usage for subwoofer application is to use either the Left or Right path of Channel 1 to convert from RCA unbalanced to XLR balanced. Channel 2 converts in the opposite direction and less often required in this situation. 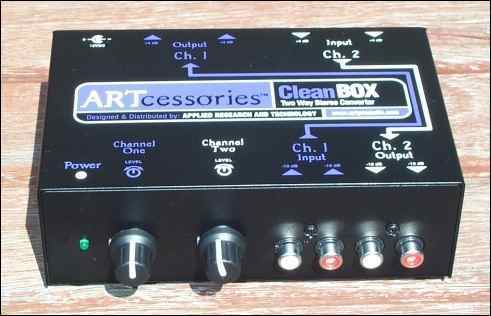 The Cleanbox is designed for musician use, where the signal is not much below 30hz. 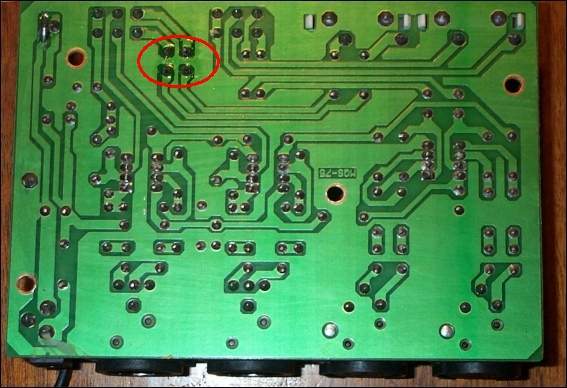 The input capacitors shown circled in the above photo are for Channel1 (RCA to XLR conversion) and cause a dramatic insertion loss for just the frequencies treasured by subwoofer users! The reverse direction, (from XLR to RCA), doesn't have this problem. 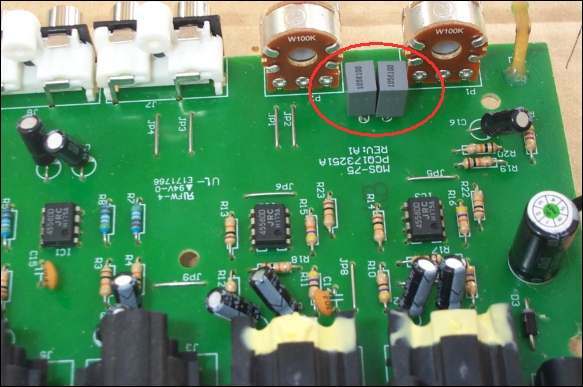 Increasing the value of input capacitors from 0.047uF to 1.0uF will give a new response that is flat to below 10hz. 0.47uf or 0.68uf would have been OK too, as would 63V rated. 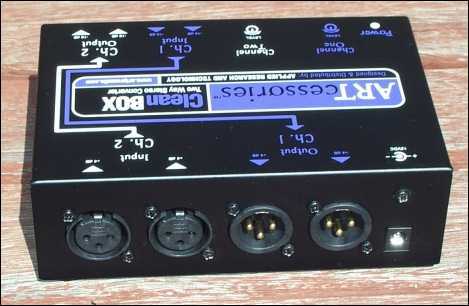 Early versions of the cleanbox came with a switch-mode plugpack. 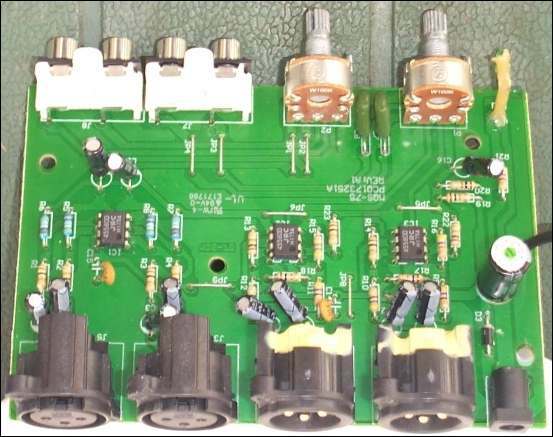 For installations where the signal shield is above earth, (eg double-earthed devices with any earthed ones connected via optical leads), this can introduce RFI noise. 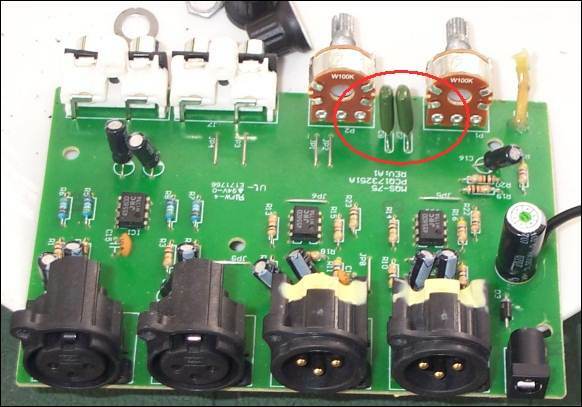 If there are problems with your tuner, changing to a transformer plugpack can fix it. Some info on +4 / -10 dB What are these levels anyway..? An alternative to the Cleanbox is the S-Convert from Samson Audio A tad more expensive, does the same job, but no mod required.